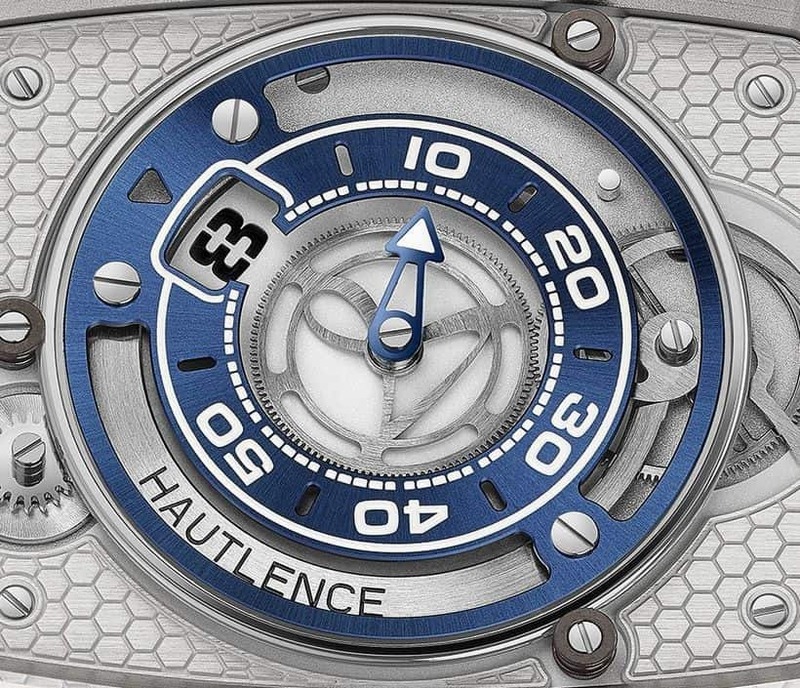 The familiar Hautlence design codes are now taking a new form, with the launch at Baselworld 2018 of the new HL Newton, featuring a fun new automatic jump hour movement. The new Calibre HTL 201-1 powers a different type of time telling activation, with jumping hours that show the time with a simple wrist tilt, the watch on a ‘standby mode’ (so to speak) at other times. 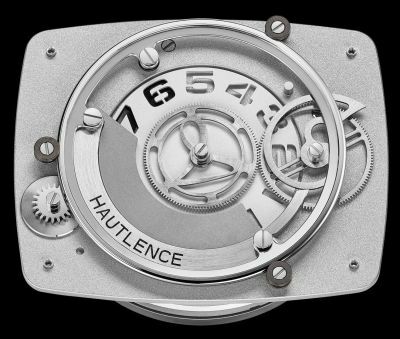 Hautlence are also flipping the conventional idea of what moves, with the window instead of the hour numeral, in motion. This happens via a mobile window on three bearings with an off-centre weight. A central wheel skeletonised in the form of the Moebius symbol drives the blued minute hand. The hour disc is silvered opaline disc, with the numerals also skeletonised. The opaline base dial has a honeycomb pattern which consists of engraved silvered inserts. A blue DLC-coated mobile central flange is driven by a snail, which performs a full revolution every 60 minutes. It has a minute track and a window that displays the on-demand time. When minutes pass, the flange moves to the correct location, bringing the window to the hour and the minute track. 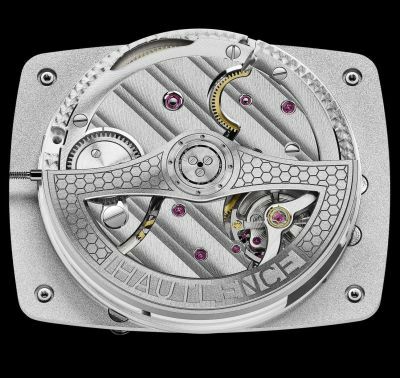 The movement can be seen both front and back; the front has sand-blasted finishing, with components hand decorated and finished. On the rear, there is the use of double Cotes de Genève, as well as more components that are hand decorated and hand finished. The titanium case measures 39mm x 46mm, with a thickness of 12mm. It has double AR-coated sapphire crystals and it is water resistant to 30m. Screws and the decorated crown, are also in titanium. The back is satin-finished as well as polished, and engraved with the brand’s name. 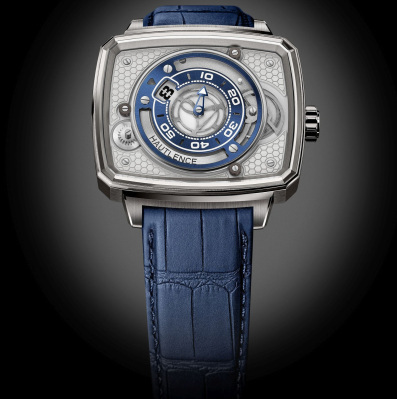 It comes on a rolled-edge, rubber-lined blue Louisiana alligator leather strap and a titanium folding clasp. The new Newton 01 has an RRP of 26,900 CHF (including taxes). Speaking of ‘time on demand’ watches, a watch that garnered a lot of attention when it was launched in 2011 was Hermès’ Arceau Le Temps Suspendu, which ‘suspends time’ thanks to an Agenhor/ Jean-Marc Wiederrecht movement. It features a retrograde complication that brings both the hour and minute hands to a recessed area at 12 o’clock, hiding the retrograde date hand until a pusher is pressed and the hands fly to the correct time position. I am at a loss for words. Fugly does not even begin in my opinion to describe this watch. While the technology may appeal to many, the looks are enough to make me look for similar technology in a normal looking watch.